Having missed out on the on-going FIFA World Cup and just by a whisker, Zambian’s have turned their attention to the 2022 FIFA World Cup to be held in Qatar. There is a saying – Failing to prepare is actually preparing to fail, Something Zambia needs to reflect on alot if the dream of a maiden appearance at the biggest sporting event on the planet stands any chance of becoming reality in 2022. German football was booming ‘obviously’ before their recent disastrous World Cup outing, reaping the rewards of the strategy drawn up after their dismal performances at Euro 2000, when Germany finished bottom of their group. Forced into an overhaul of youth football, the DFB, the Bundesliga and the clubs decided that the development of more technically proficient homegrown players would be in everyone’s best interests. This led to the creation of academies right across the top two divisions. Germany went on to win Euro 2008,2012 and the 2014 FIFA World Cup. 26 of the players Bayern Munich and Borussia Dortmund named in their Uefa squads in 2013 season were homegrown and eligible to play for Germany. 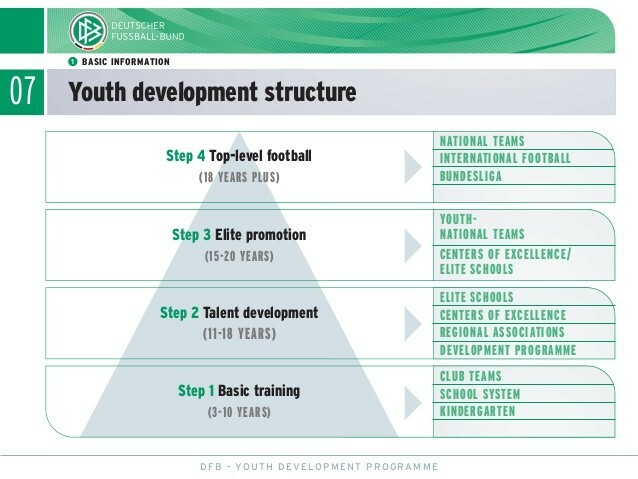 More than half of those players came through the DFB’s talent development programme, which was introduced in 2003 with the aim of identifying promising youngsters and providing them with technical skills and tactical knowledge at an early age. Covering 366 areas of Germany, this impressive initiative caters for children aged 8 to 14 and is served by 1,000 part-time DFB coaches, all of whom must hold the Uefa B licence and are expected to scout as well as train the players. Back home when the late Keagan Mumba was head coach at Super League side Zanaco he would take time off his busy schedule to visit youth teams in Chawama Area and just to impart some of his knowledge in the youngsters, You can imagine how much it meant to a ten or twelve year old playing on a bumpy dusty pitch pitch in Kuku (Chawama, Lusaka) receiving instructions from a high profile coach. Coming up with a system like that of the DFB can not be done at once and abruptly because it needs alot of finances and time to perfect and execute properly but regular football clinics might be a starting point . It’s high time people like national team technical director, Moses Sichone were put to good use. He has alot of experience playing at the highest level and with his qualifications he can co-ordinate the football clinics with other high profile coaches. A properly thought through plan needs to be formulated where the expectations and what needs to be done are outlined. Nothing happens by accident in life, Football is no different and it’s not even rocket science. The Football Association of Zambia can and needs to engage all stake holders to come up with a workable road map towards qualifying to the Qatar 2022 FIFA World Cup which will mean everything from that point onwards will be done to achieve that one goal and the rest will be secondary to that objective. For anything to happen implementation has to be executed with perfection otherwise it will just be another failed idea. Everyone has to buy into that idea to make sure it achieves it’s intended purpose. By now it’s clear Zambia does not lack players but serious coaches who can guide the team to the very top. The nationality and colour of the coach is of no consequence as long as he has the ability to deliver the desirable results. The new should be one who is willing to work with all the good players available. There is no excuse for a coach who leaves out a performing Evans Kangwa in the Russian League and he is actually a key player who puts in 90 minute shifts and prefers a bench warmer from Zesco United or Zanaco and then goes and gets exposed at a tournament. A coach calls players who he can work with/can fit in his plans to the national team but a coach should not be stubborn as to stick to his system or philosophy that’s not working but rather if such a scenario occurs, He must be ready to change his philosophy to play to the strengths of the best players available. With the Association set to announce the appointment of Belgian coach Sven Vanderbroek it’s a hope of everything soccer loving Zambian that he has the tools to take Zambia back to the top. The football Association of Zambia can come up with a deliberate policy to encourage teams to use young players in league matches helping them to gain the much needed exposure and experience at a young age. They can find a way of motivating clubs to do that by giving some form of reward to a team for using player (s) below a certain age ( e. g U20) . This will increase the number of young players available for national team selection with the necessary exposure and experience. This will prolong the lifespan of national team players. Does it not hurt that the best the country got out of Winston Kalengo was just one single good year? (2016) if nothing is done then this will be the order of the day. In Manchester United’s striker Romelu Lukaku’s story “I have got some things to say” he talks of how he was a failing to score for Belgium despite being prolific at Club level when he was between 17 and 19 years old. Chipolopolo striker Patson Daka who everyone is now so happy with and proud to talk about was insulted not so long ago but today he is one of the best young talents on the continent. The point is not about Lukaku’s misfiring or the insults Patson was showered with but the fact that players need time to develop and mature. Playing at national level comes with its own pressures like getting used to playing in front of a huge crowd, high level matches etc. If players are exposed to such levels of football at a young age the country will have a big pool of players to choose from with a long life span expected not just after one two years a player is on their decline just because they were identified late. This is obviously a long term thing and goes beyond just qualifying to Qatar. The MTN/FAZ Super League has developed in recent past and has become one of the best leagues on the continent with huge amounts of monies being splashed around. This has caused a rise in the number of foreign players trekking to Zambia to play for any of the 20 Super League teams, Some are even playing for lower tier sides with Congo being the major contributor of those players. Just last year, Team Kopala (Buildcon) lined up an all foreign starting line up. Obviously the increase in foreign players has contributed to the development of the league but what’s the incense of having a developed league when your national team can’t benefit and keeps coming up short at major tournaments. In China after the influx of foreign players they came up with a limit to how many (5) can be in a match day squad of one team because they want the league to develop but not at the expense of sidelining their local talent. Zambian players need to be given priority as the country looks to have a balanced development between the league and the national team but of course they also need to work extra hard. The road to Qatar is long and bumpy but with a clearly thought through plan well implemented it’s very achievable but the preparations must start now or else it’s never going to happen. Once we start and the new coach comes in. The players will respect the coach and the fans alike…they will play for the team achievement. We will go under the radar and do it quietly. We will qualify quietly. Obviously we will be patronizing social media space on http://www.zamfoot… I think on our own as a country we have recovered from the Gabon disaster. First step build Levi and Heroes stadium. And win 2 AFCON. Lets clap for ourselves. Now it is about building on it. We have foreign national coming through, there are fewer players in some leagues like Bundesliga because they have so many good indigenous players. So you need to build infrastructure everywhere to provide a system for correct development of talent for the clubs. I mean where there is no football or sports facility Dangote can easily get a piece of land in such a place, put goal posts in the ground, a running track and netball. Put a few concrete stands. We are gone. FNB has been donating artificial football pitches to schools in South Africa…pangono pangono. I’ve always wondered about putting limitations on the number of foreign players a club can sign or field. Yes many like the writer here feel it hampers the growth of the national team but if that is the case then why are Bafana bafana in the spot they are in. They hardly qualify for anything these days so much so even the Cosafa is eluding them and yet they have very strict limitations on the number of foreigners a club can sign. So since they implemented the limitations it has not helped anything with regards to the national team, in fact things have gotten worse. So why then do we stick with the assumption that limiting foreigners in clubs will help the national team? One could argue that good foreign buys only improves the league and inevitably locals need to up their game to compete. To beat the best you must be able to compete with the best not so? If you box yourselves in mediocrity then how will the national team ever be able to compete with the best? Well said “Big Steve 4rm SA” let our players work hard! South Africa has qualified to WC, won Afcon, Clubs have won champions league. They might be down now but they won’t be down for long. Caps on foreign players is important, it is a responsible thing for a league to do. Stop the wealthiest clubs just buying their players and them being responsible for developing them. Insure there is some competition between the wealthiest and poorest clubs which is good for the league. As to the main article which i don’t disagree a thing with, i only point out now is the time. We have to use everything we have now to acheave in the next 3 years. HR had 2 chances a wc qualification, this time we want this go right first time. Qualification for Afcon first. Wining Afcon is not really important but reaching the quarter finals or semifinal will be useful for us. That is the development time Limit SV has to work with. After that there are no excuses, Zambia must be spitting nails in the first game of qualifiers. There is only one time i have seen Zambia spitting nails since 93 and that immediately prior to Afcon 12 when whacked South Korea in 4 goals in South Africa then followed that at Afcon. SV has to get things right very quickly, every step we take must be a step forward. Yes we have to be very sharp and focused now. Let him see the players we have the experienced and young, make an initial squad and we develop on from there. Props to Zamfoot for the article work starts 5yrs before the worldcup. Truth be told we have under achieved at National level. It s difficult to pinpoint the reason as we have a big pool of players to select from as say compared to Swaziland and Lesotho. Yet the North Africans regularly scoop honors, in fact they dominate . My opinion is that VAR will nullify defenders to some extent and skillful football will flourish. Its maybe not a surprise Germany fell at the first hurdle , their days of skillful and tactical fouling are over. To conclude skill is one aspect , mental strength is another. A sports psychologist could be of some help.